Events are building to a climax in Sachaka as Lorkin returns from his exile with the Traitor rebels. 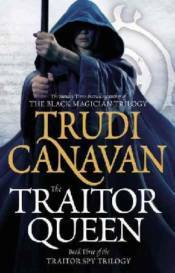 The Traitor Queen has given Lorkin the huge task of brokering an alliance between his people and the Traitors. Lorkin has also had to become a feared black magician in order to harness the power of an entirely new kind of gemstone magic. This knowledge could transform the Guild of Magicians - or make Lorkin an outcast forever.